I decided to finally see this for two reasons, neither of which has to do with the movie itself, and both of which had to do with goofy in-jokes with my friends. First: My friend Greg and I used to have this game which was entirely stupid, but which never stopped making us laugh. We would take bits of dialogue from movies, or nursery rhymes, or whatever else came into our minds and then deliver them in Arnold Schwarzenegger's voice. It really doesn't come across well in type, but just try it. Say "Don't run with scissahs!" and see if it doesn't put a smile on your face. Anyway, I always felt like my funniest one ever was putting on the Austrian accent and saying, "I'm just a girl, standing in front of a boy, asking him to love her." Trust me. Second: Rhys Ifans, who plays Hugh Grant's roommate, is the comedic highlight of this movie. This made me think of a time in college when my friend Kyle demanded an English guy in the dining hall to tell him, "Is everything funnier in England? Because it looks that way in the movies." That's really nothing to do with Notting Hill. I guess you had to be there, because at the time it was hilarious. 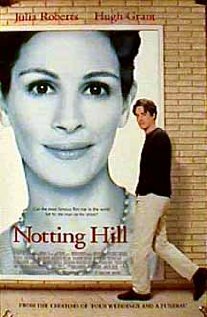 I liked this more than I like most Julia Roberts movies, and that's because it's also a Hugh Grant movie. He's not the greatest actor in the world, and truthfully, he's been in more mediocre movies than really good ones, but he's just so charming, you know? Every now and then, an actor takes part in something that you enjoy so much that you're willing to give them a lifetime pass, no matter how much dreck they take part in afterwards, for instance, Claire Danes and "My So-Called Life." For Grant, the movie About A Boy is his lifetime pass for me. (Seriously, if you haven't seen that movie, please do make plans to see it. I love it.) Julia Roberts is kind of a guest star in this movie, which made it much more palatable. Plot - Grant plays Will, a divorced man who owns a bookstore specializing in travel books. He lives with Spike, an eccentric and slobby Welshman. World famous movie star Anna Scott (Roberts) comes into his shop one day, which leads to a conversation and romantic interest. She joins him as a date to his sister's birthday party, surprising Will's friends both with her presence and her friendliness. As the relationship begins to grow, though, Will and Anna find that their lives are simply too different to be compatible, and when Spike's careless talk ends up bringing a crowd of paparazzi to Will's doorstep, she feels betrayed and breaks things off. Will spends the next year getting over her before finding out that she's back in London for another movie shoot. They meet each other, obstacles arise, they end up together, the end. There's a scene in this movie when Roberts' character approaches a table full of men in a restaurant and puts them down for speaking poorly about her a few moments earlier. Maybe I'm too cynical, but it seemed like this scene was filmed specifically with people like me in mind. "See?! If you hate on this movie or say bad things about the people in it, you're no better than those boors in the restaurant, who Julia Roberts so handily emasculated!" But the problem with a Julia Roberts performance is that, with the exception of a few things, she draws from the same little bag of tricks for every single role she plays. She hasn't expanded at all since Pretty Woman. You know the scene in PW when she returns to the store that wouldn't sell her stuff earlier and tells them off in that very even, calm, revenge-served-cold voice? That's the exact same delivery she used in the scene I just described. It's the exact same delivery she used in Erin Brockovich when she's just served the PG&E executives water from the polluted town. It worked once, in the PW scene, but she just keeps going back to that well again and again, and it makes for very unsympathetic characters. But then, I'm probably just a hater who deserves to get embarrassed at a restaurant. LESSON - Thinking of a different lesson each day has sort of become a chore. I'm committed to doing it, because it was a condition of the project, but I'm finding that few of these movies are applicable to mine and Courtney's relationship, or that the lesson is some variation of, "Just follow your heart! That's what I do! "﻿ I guess the lesson from today's movie would be to make sure that you and your partner have matching expectations of your relationship. I'm just a hater-- and/or have totally different taste in movies than you have. I saw this in the theater when it came out and walked out afterwards feeling disappointed for spending money on it. I love the Schwarzenegger method! Seriously, Danny, that Schwarzenegger game sounds awesome! It's funny to me that you said it doesn't come across in type, because I laughed out loud just by reading the concept. Oh, Julia Roberts. She sure is Eric Roberts' sister. "Oh, Julia Roberts. She sure is Eric Roberts' sister." That's such a good line that I wish I'd thought to use it myself. I pose as a hard-hearted hard heart haver but this movie's a guilty pleasure for me. And you're right; it's made so much better by the casting of Grant and, more, the underrated Ifans. See his performance in "Greenberg." But damn your for Teutonically-sacking my favorite line of the movie. You'll never hear it the same way again, Will. Here's another for you to hear in the Schwarz-voice: "A dream is a wish your heart makes, when you're fast asleep." But for the syntax, my Schwarzenegger is more Yoda. Which turns out to be a fun spin on your game. "Just a girl I am, standing in front of a boy. Asking to love her him. I?" I love it. "A hill of beans, the problems of three little people do not amount to!" I dunno, Casablanca was the first thing that came to mind for the Yoda treatment.